Yay! I’ve been for a run today. And it felt good! At this point, it’s still a ‘run-walk’ as I start to build my fitness levels back up. It’s the second time I’ve been out in the last 10 days. I would have done more, but I’ve had a mad busy few days that have included dining with friends, hot-footing it down to London to see Soft Cell at the O2, a spa day with my mum, as well as a meal out with family to celebrate her (shh … she really doesn’t want anyone to know her age and is trying to let it pass under the radar, which is silly in my view as she is so fit and well, and doesn’t look her years in the slightest) 80th birthday. Mum and I also went to the theatre to see Matthew Bourne’s ‘Swan Lake’ – part of her present from me. So you can probably see that I didn’t quite have the time (or energy) to squeeze in running laps of the village and beyond! I’ve mentioned before about taking small steps, as bite-sized pieces of action are the key to achieving bigger goals, and whilst I’ll never be a prima ballerina or an Olympic athlete, getting back out exercising feels good even at these early stages of building back up to a proper run. A friend has recommended the Couch to 5K app, but I prefer to run without my phone or any kind of fitness device; I really like to be with my own thoughts when I’m running or walking, as it helps me think things through that might be on my mind. The programme I have designed for myself right now consists of running for a good chunk of time, and then walking for a short distance to regain my breath; I use markers along the way to measure how far I run each time. I keep saying to myself, I’ll walk when I reach the end of the road, and if I’m still going strong, I will keep going to a point further along, and so on. Today, I added on an extra section, even though I walked part of it. A few years ago, I ran the same route easily without stopping, and even 3 times in a loop when training for a half marathon. I know I can do it; it’s just a case of building myself back up to an easy 5k run. I’m not so sure about another half marathon, but hey, never say never! I do, however, have the local Park Run on my ‘To Do’ list. I’ve signed up – just need a free Saturday morning to book myself on and go do it! Not only am I keen to get fit through running, and hopefully shift a few pounds, I want to get refocused on what I put into my body in terms of fuel, aka food. At the beginning of 2018, I managed to lose a couple of stone by being more aware of what I was eating and drinking. 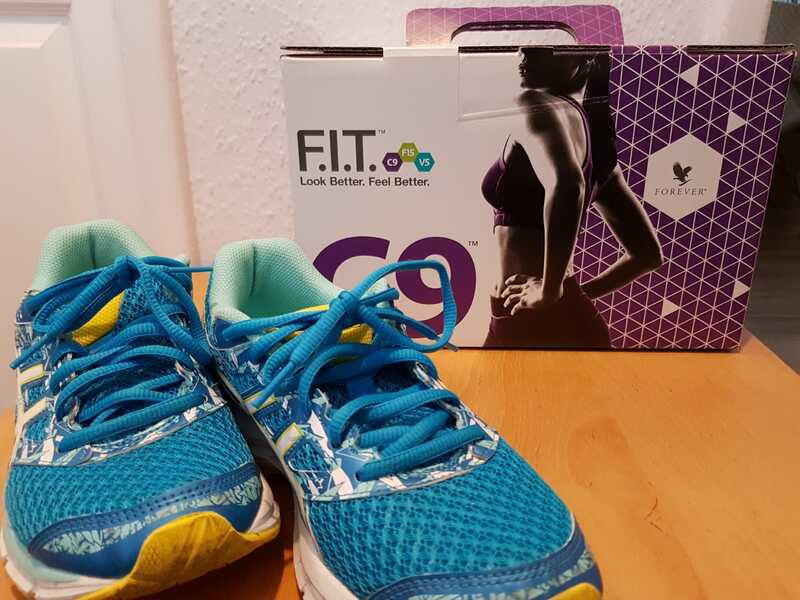 I kick-started my weight loss regime with the Forever Living C9 Cleanse – this is a detox style programme that involves drinking aloe vera juice daily, eating a set number of calories and dropping caffeine and alcohol for 9 days. I knew the programme would enable me to break the patterns of behaviour that had become ingrained in relation to the food I’d been cooking and eating. Following on from the 9-day cleanse, I continued not to drink alcohol for the best part of a month and was far more careful about what I was eating. I introduced a lot of vegetarian / vegan meals into my diet rather than just buying packs of beef mince and rustling up spag bol or chilli on a regular basis. Good patterns and healthy eating habits emerged, and the weight loss followed. However, it’s all too easy, when busy, to fall back into our previously ingrained patterns of behaviour. This is what has happened to me over the past few (mad busy) months. My newly created patterns of eating healthily and consuming non-alcoholic drinks have gone somewhat, although not totally, askew – and so has my exercise regime. I have managed to continue to attend a weekly yoga class – which I love, but other than this, I haven’t been able to sustain a regular pattern of exercise. So right now, I’m focused on getting back into the good habits, albeit a bit at a time. Given that I’ve still got a lot on – I didn’t mention work earlier – I am running my busy recruitment business as well as coaching. Oh yes, I am also juggling workmen as I embark upon a complete refurb of my lounge! With all this going on, I am trying to be kind to myself and, with small, bite-sized steps, I’m creating a pattern of exercise that works for me and fits into my daily life. I am about to embark on the C9 Cleanse again. I don’t have as much weight to lose this time, so I am hoping that as a result, I’ll lose that bit more this time. At the end of the day, if we find ourselves veering off target, we can always realign ourselves with our goals and get cracking again, having already experienced the patterns of behaviour we want to become the norm. Bit by bit, our new habits will become second nature and we won’t even have to think about them. In my case, each time I create new vegan or vegetarian meal, I am another menu closer to stopping buying and cooking meat. And that approach is the same for any goal we are attempting to reach. Just gotta to keep at it, keep trying and learning along the way! I’ll be back with an update on my health and fitness journey in the coming weeks. In the meantime, if you are striving to achieve something in your life, keep focused, enjoy the journey and love the learning you’ll gain along the way.